Here's Tim's Merry Christmas Pup, Gingersnap - aka "Ginger"! PIcked her up in Boston at Logan Airport this past week as a surprise on our trip back from Rhode Island. She's a Yellow Lab from Arkansas...one of a litter that my nephew's dog, Peanut had. 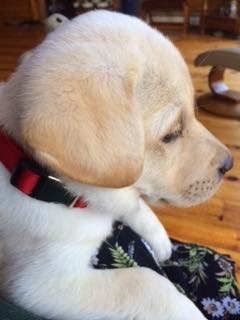 When we went to Arkansas in September for my niece's wedding, I laid claim to one of the Christmas pups from Thistle's Labradors, and I kept it a secret from my husband right up until a few hours before we had to pick her up at the airport. Ginger has met, but not yet been appreciated by our cat, Noah (which you can read more about on "I, Noah Cat" blog - to the right =>). 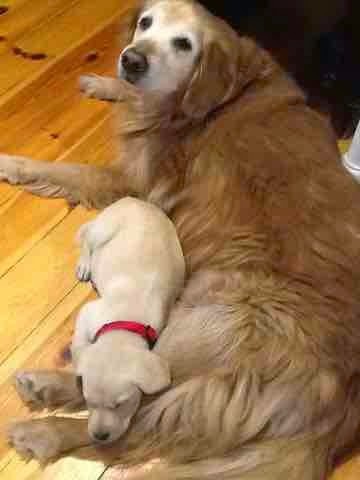 Pippi, our aging Golden Retriever, however, is accepting Foster Mom duties very well - letting Ginger cozy up and sleep, and correcting her with low growls and bared teeth when she gets a bit too rambunctious! Many years back she was the puppy being mothered by our old Golden, Nutmeg, aka "Meg", so it's payback time! I am tired. I have not had a puppy for a LONG time. I'd forgotten it's like having a baby that can already walk and run, puts everything in its pin-filled mouth, and poops and pees at will without benefit of a diaper. I haven't had a full night's sleep since she arrived as she whines to go out every few hours. I've memorized the path from bedroom to leash to crate to front door without opening my eyes. I've become accustomed to standing outside in pj's in freezing temps because I don't have time to grab my coat (I have not yet put it on my memorized route for some reason). So far I've always had shoes on. However, I have stepped in more doggie-droppings in the past 4 nights than I have in my whole life...it's hard to see in the dark with wet brown leaves on the ground...well, and trying to stay asleep through the process. But all in all, it's worth it for the puppy kisses, and the warm, fuzzy, limp and happy puppy body curled up asleep in a lap. Babies and puppies...God made them cute, so you'd keep them and love them in spite of all the bother!! It's finally Deja Vu again. I thought I'd never see this day again! So here's my post that needed reposting - one that had not been vu-ed deja so much. It was a Saturday... November 8, 2014... to be specific. Not much traffic that day as I cruised the interspace highway. If you go to DL Hammons or to the links at the bottom of this page, you will find more little known but treasured links. It is also Poetry Friday, hosted by Buffy Silverman - so head on over to Buffy's Blog for more poetry offerings! On Friday, for Poetry Friday, Margaret Simon explained how she used her students as "guinea pigs" (so to speak), offering them a writing technique/prompt she had seen done by their state poet laureate, Ava Leavell Haymon, at the Book Festival Wordshop. Her explanation and results are on her page Reflections on the Teche here. 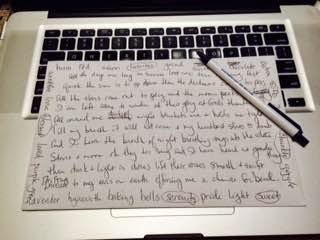 I decided to try the exercise, since I had a pen and the back of a large envelope right here handy beside me. And this - with only a couple of very quick edits, is my "free writing" in 7 minutes. It was supposed to be free writing - not a poem (complete with rhyming), but this just came out. It is always a wonder-ing feeling when this happens. I can never explain why sometimes words are easy and others they are labored over. Was it the exercise of the writing of the words, the disregarding of the internal negatives thoughts, was it knowing I was going to write something not planned out, that I'd spontaneously would put on paper - and that I didn't have to share it if I didn't care to - like if it was stupid and terrible as the voices had said it would be before I disregarded them? 7 minutes - With the rest of the exercise, it was probably 15 minutes total for prep and both pieces. I may try it again next week. It seemed to free up the brain. Thanks for the exercise, Margaret and Ava! Now the time is going fast. At their glory, at God’s thunder. My hand is still, and God wields pen. So here's a short poem for today. I have lots to do and little time to write. Look at the date! Do you see how close we are to Christmas? Well, I am not ready for it. Okay, this was supposed to be a short poem, and it ended up being one. However, I wrote in Pages, then copied and pasted it here. I wasn't happy with it. So it got longer. Then I edited and revised in this space. I cut most of it. This wasn't even in the original originally. It was a last minute addition and the only part I kept. I just say that because I find it strange how poems happen sometimes. And because I'm proud of myself. Not for the poem itself, but for the fact that I am getting better at just cutting through garbage. Just because I wrote it, doesn't mean I have to own it. That is a hard concept sometimes - a "Yes, but I had more stuff - how can you tell me it isn't worth the cyberspace it was printed on?" mentality that I love challenging. I love winning that debate with myself! Ok...now onward to more Poetry Jammers who are writing about 'Quiet' this week! Wednesday's Poetry Jam prompt was to write about hands. This is my second poem...I tried one yesterday, but wasn't too happy with it. It needs more work. So I wrote this one this morning.